Today’s Flash Back Friday comes from Episode 63, from July 2012. Jason Hartman is joined by head of The Net Results, James Jones, to talk exclusively in this interview about Kindle and how to create direct profits. James defines Kindle Triangulation, which starts with picking the right niche by doing market research. Most books that don’t perform well in the Kindle marketplace are the result of a topic in which buyers are not interested. Seller rank of 25,000 or less and a topic or subtopic with fewer than 500 available products is key to finding the best niche. James explains the math process used to determine that competitive niche. He also talks about promoting books on Amazon. The second side of the triangle is Book and Game Creation, and the third is Ranking. Before Facebook, Myspace, Twitter, Linkedin, or PPC…before spam was anything other than a lunch meat…before any human being ever uttered the words “Google” or “Yahoo”…James J Jones was making money online with Bulletin Board Systems (BBSes) and Online Services by selling info products and computer supplies. Back then James found email to be the absolute best method for marketing his products. 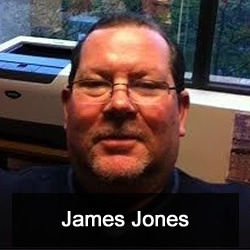 In 1996, James put up his first website. Though he could only afford to work online a few hours a week, he saw his online income continue to grow. By January of 2002, James realized if he put just a little more effort into his “hobby” he could quit his job and work online full-time. So he made a commitment to do just that and by July of 2002, James was making enough money to realize his dream of working for himself. Today James runs The Net Results — a company that specializes in developing leading edge software and training materials for the Internet Marketing Industry. He uses most if not all of the popular marketing methods to promote his business including: Adwords, Facebook, PPL, SEO, Twitter, etc. But email is still his most powerful marketing weapon.